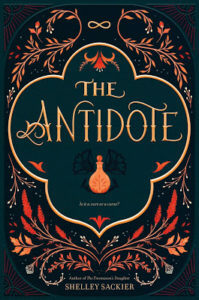 The Antidote is a book full of secrets, mystery, all with a stunning cover. Today I am so happy to be able to host a review of this gorgeous book for this blog tour. And make sure to scroll to the bottom for this giveaway! There are secrets all throughout The Antidote and you never know really what is going to happen, until it does. And then you kind of wonder where all the clues were. The Antidote is a book I would recommend to those who like mystery novels and want a taste of fantasy as well. It is a story about forbidden magic, about having to realize that everything you have been taught is not necessarily true, and the meaning of friendship. One of the main things you have to know about the world in The Antidote is that magic is forbidden and that when we begin the book, Fee’s kingdom is at the end of a period of time in which they were quarantined from the world. (My quotes are based on my ARC not the finished copy, so there could have been modifications made in the final version). Because of that, there hasn’t been contact with the neighboring kingdoms and Fee and Xavi have grown up almost exclusively with each other. So this unique part of the world creates an interesting dynamic where they have been mostly isolated and are not sure what is going on with the other parts of the world. That in combination with Fee’s best friend being outside of their kingdom for the entire duration, means that when they finally are reunited, there are a lot of sparks and they feel like strangers. Sackier is really invested in keeping the mystery and big reveals until the end. And while it may work for many other novels, in The Antidote you really have to push through the first half for there to be answers. I had many moments of confusion and frustration at the lack of world building. But if you keep reading, there is almost an waterfall of information about Fee and Xavier’s identity, as well as what has been happening with Fee’s best friend while they were separated. And basically everything changes into something else entirely. In general, this was my biggest struggle with the book, is that for the first part it felt a bit like wading through heavy fog. And I wasn’t sure where I would end up on the other side. Until the reveal, what you have to work with is a little thin. I knew people were afraid of witches and that magic was forbidden, but I didn’t really understand why and where Fee fit in. My favorite part of the novel was Fee’s characterization because she so acutely feels like she isn’t enough. She realizes that her mentor, and mother figure, wants her to be more obedient and that she shouldn’t use magic. 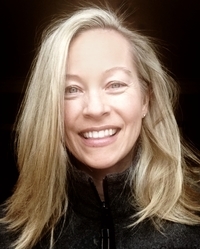 Which results in Fee feeling so conflicted, unable to be herself, and knowing that even when she hides who she is, she still isn’t successful. Her struggle immediately makes the reader empathize with her, witnessing the pain of knowing you can never match up to someone’s expectations, no matter how hard you try. Additionally, Fee’s character has a lot of growing up to do and so many revelations to witness. I definitely felt bad for her, because within the span of the book her entire world changes. But I think this is another feeling readers can identify with, just like when you realize someone isn’t who they were, that your family wasn’t as happy. So while this book can take some time to get started, I think it ends really strongly. The second half is really focused on the mystery of Fee and the whole kingdom for that matter. It’s like a fantasy murder mystery (without the heaps of murder), and I just wished the first half was a smidge less confusing to me. Make sure to scroll to the bottom for the giveaway! Check out The Antidote on Goodreads, Amazon, Indiebound & The Book Depository. Her first novel, DEAR OPL (Sourcebooks 2015), is a tale about a snarky, overweight thirteen-year-old, who suffers from loss everywhere in her life except on her body. Her next novel, The Freemason’s Daughter (HarperCollins, 2017) is a story about a 16 yr old Scottish girl living in 1715 who’s raised entirely by six burly Scotsman–and they’re all smugglers. 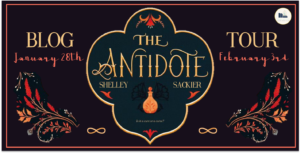 The Antidote (HarperCollins February 2019) is a YA novel about magic and medicine, and the witches who wield them both. What fantasy book has the best world building? I adore the world in The Bone Witch!